How to Save Money…. FAST! If you’re in a financial pinch, there are two basic ways to start saving money quickly: cutting expenses and bringing in more money. 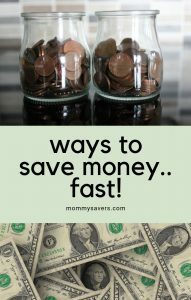 Here are some practical ideas to leverage both, and start saving money… fast. Cancel your gym membership and start working out at home. You’ll never run out of free workouts with a YouTube subscription. Or, check out workout DVDs from your library. Cut cable. There is enough viewing available online, especially if you have Amazon Prime, Hulu, and or Netflix (but cancel those too, if you really want to save money). Do you have any other subscriptions or memberships that can go? Evaluate ALL of them and cut what you can. Instead of buying more groceries, try using up what you have in your pantry and in your freezer. Get creative with what you have instead of buying more. When you do buy groceries, concentrate on these 25 cheap healthy foods that give you the most nutritional bang for your buck. Instead of buying gifts, make them yourself at home. You don’t have to be creative or crafty. We have dozens of frugal gift ideas that anyone can make. Save money on your electric bill by installing a programmable thermostat, switching to LED lights, and unplugging anything not in use. Start taking public transportation, biking or carpooling to work when you can to save on gas money. Stop going out for entertainment. Instead, start eating in, having friends over, and watching movies at home. Don’t feel as if you need to provide drinks and food for friends, either. Hosting a potluck/BYOB gathering is just as much appreciated. Set up an automatic transfer from your checking account into your savings account. If you don’t see it, you won’t miss it. Start selling anything you no longer need. Chances are you have a lot of household clutter that you can exchange for cold-hard cash. Facebook Marketplace is a great spot to start, as are other trading/for sale groups on Facebook. If you have name-brand clothing, consider selling it on Poshmark.com. First, download the app. Next, snap a picture of what you want to sell. When you make a sale on Poshmark, they even provide you with a pre-paid, pre-addressed label ready to be put on the box. Once your sale has been packaged, you can drop it off at a USPS mailbox or even have it picked up for free from your home. Get a second job outside the home if you’re really in a pinch. Sites like LinkedIn and Indeed can help connect you to available jobs in your area. Some of them are even available to do from home. Trade in your car for a less-expensive model, pocketing the extra cash. Look for one that gets better gas mileage and is less costly to insure. Are there services you can provide to your friends and neighbors? Are you available to walk dogs, cut hair, do yardwork or run errands? Get the word out there! Your friends are your best PR agents! Do a good job for them, and they’ll tell others! If you are good at graphic design, social media you can sell your services on Fiverr.com. I even saw people selling relationship advice, meal plans and psychic readings.